Why spend $1,000 on a security system and then pay someone to install it? That’s the question posed by the makers of the PLUGCAM. 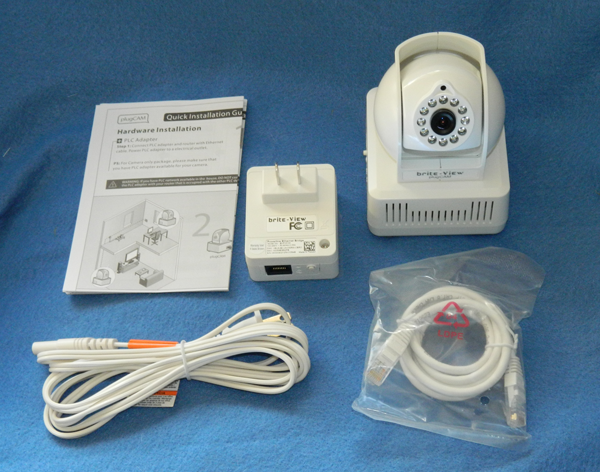 It’s a security system in a box that does everything you need for a seriously low price, and is so easy to install that anyone can do it! The folks at Solid Signal sent a PlugCAM for review, and it arrived in nice retail packaging, ready for its glamour shot. The PlugCAM promises to be a simple, easy security system that works with your smartphone or tablet or can work with a PC as a full featured security DVR. 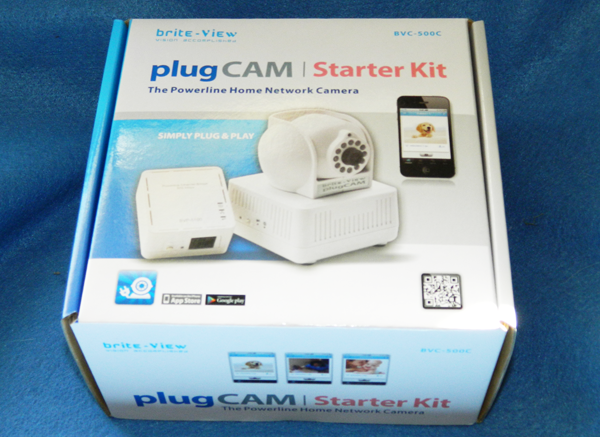 The PlugCAM comes with the camera module itself, power cord, a powerline adapter, ethernet cable, and instruction booklet. Everything is bright white and although it has a somewhat less industrial look than a black or nickel-plated system it looks like everything is built with quality in mind. The first thing that struck me was the powerline adapter. Ethernet-over-Powerline, also known as HomePlug, has been around for several years, and is a good alternative if you need high-speed transfer in a room without a wired connection point. There are some limitations to powerline networking, though. The data travels over your home’s copper wires, and if there is already excessive noise on the line the adapter may not work. 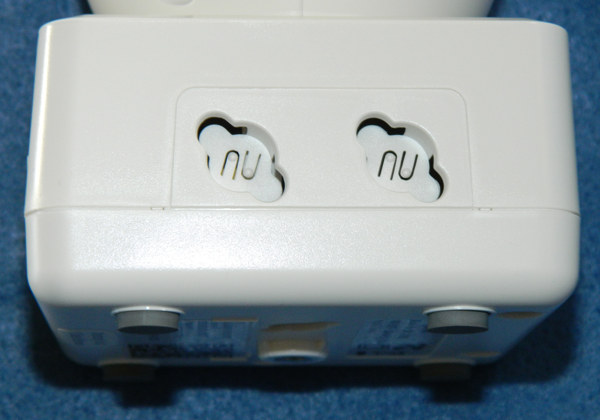 Powerline adapters have been known to have issues with high-wattage fluorescent lights, and if your home has two separate breaker panels, the PlugCAM and its network unit must be in the same box. 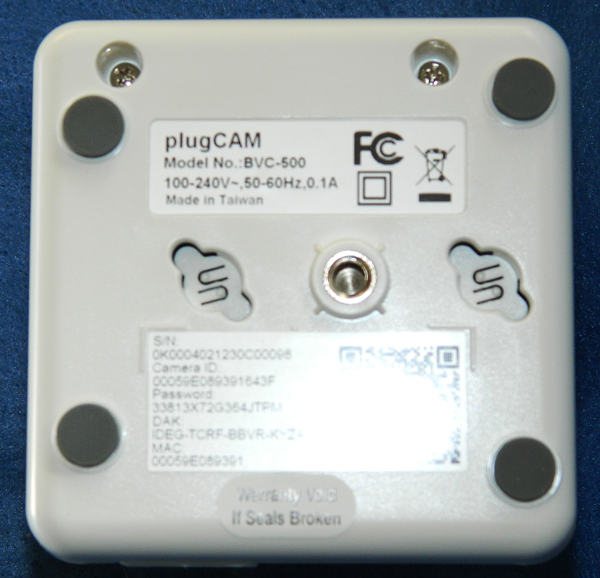 Some breaker boxes have more than one feed line instead of using a crossover that feeds both left and right breakers, and the plugCAM’s signal will go through a crossover but not pass into a second breaker box or a second AC feed. Also, it’s important to note that the PlugCAM’s powerline networking, like all powerline networking, will not work if the network adapters are connected through a surge protector. The surge protector does an excellent job of completely stripping out the network signal. Unfortunately, the PlugCAM only works through powerline; it won’t connect direct through ethernet and it won’t do wi-fi. If the powerline networking won’t do it for you, the best solution would be plug in the powerline adapter into the same outlet as the PlugCam, anduse a wireless bridge like the WET610 to connect from the powerline adapter to your Wi-Fi network. The PlugCAM’s camera unit does tilt and pan manually. It can be a little stiff at first so be careful. 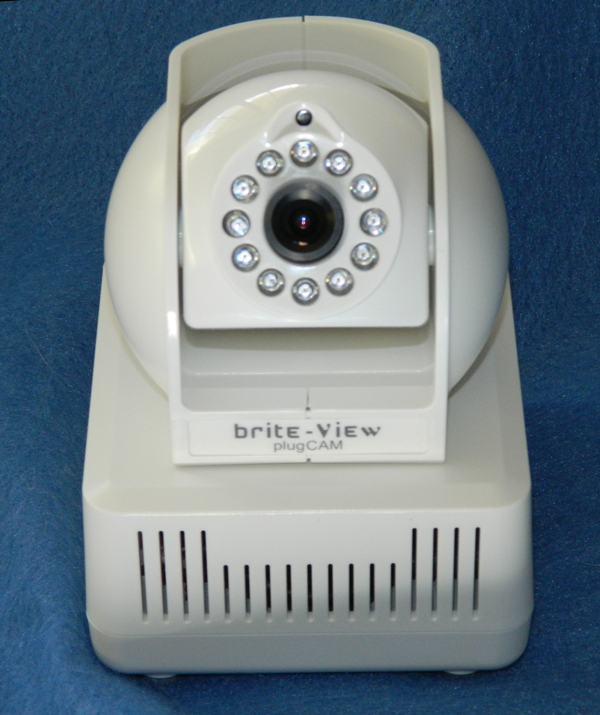 It looks like a more or less generic digital camera like you’d see in a webcam, surrounded by infrared LEDs that give the unit some limited ability to see in the dark. The only connection is for AC power. The bottom of the unit has a set of keyhole slots for mounting, a tripod mount that will fit any standard size camera tripod, and a sticker with a QR code on it. The QR code is the easiest way to connect your smartphone or tablet to the PlugCAM. There are a second set of keyhole slots on one side of the camera unit. On the opposite side of the camera unit are the only controls of any kind. There are power and network lights, as well as a push button marked with a lock that doesn’t seem to have a true purpose. Finally, there is a recessed button which will reset the camera to its factory settings if you forget the password.